Terrorist Muhaned Al-Okabi comes from a family that helped in creating the state of Israel, says Bedouin mayor. Bedouin leaders have been expressing surprise and even shock at the fact that the terror attack in the Be'er Sheva Central Bus Station Sunday was carried out by a Bedouin from the town of Hura in the Negev, 21-year-old Muhaned Al-Okabi. 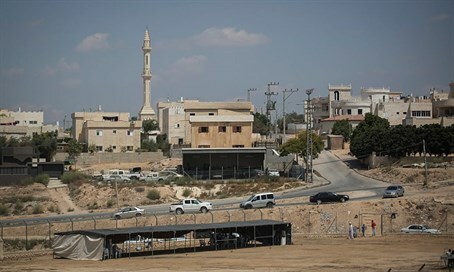 The Chairman of the Forum of Bedouin Local Authorities in Northern Israel, Zidan Kaabiya, said Monday that the Forum "strongly denounces the murderous terror attack" in Be'er Sheva. "This is not our way," he stated. "Our way is the way of peace and reconciliation, love and brotherhood, of intermeshing and loyalty." "The Bedouin populace will continue to be committed to the values of solidarity and mutuality that its relationship with the state have been based upon since Israel's inception," Kaabiya added. "The absolute majority of Israeli Arab citizens are law abiding citizens and they never harmed state security. "We call upon all leaders – Israelis and Palestinians – to calm down the atmosphere and try to reach an agreed-upon formula that will… bring put life in the region back on its natural track," he summed up. Rahat Mayor Talal Alkarinawi told Channel 2 Online that the Al-Okabi family is "well known, and not known as a family that encourages terrorism." "The former head of their family, Sheikh Al-Okabi, assisted in the creation of the state [of Israel]," he added. "That is why we are even more shocked. We are really unable to fathom this." Alkarinawi said that Jews and Bedouins coexist "like brothers" in the Negev. "We are not part of the Israeli-Palestinian conflict." Kassem Abu Sirhan, Deputy Head of the Tel Sheva Council, told Channel 2 Online that he is "certain that this was a decision by a solitary person" who came from "a family that is definitely good."